June 18th, 2008: Sunny and Pleasant, Water Temp 82*. Caught bait early, picked clients up at 5:30 and worked 4 large schools of Stripers with downlines only to catch punks and go through 100 nice Herring. Obviously the fish fed up last night on the full moon and just wanted to kill the baits. I decided to try trolling at 8 am to see if the fish would instinctly hit a bait rushing by them quickly at a high rate of speed and we started putting fish in the boat immediately. We hit numerous schools catching fish the rest of the day, ending up catching over 35 Stripers. I even tried Herring again on some schools later in the day with no success. 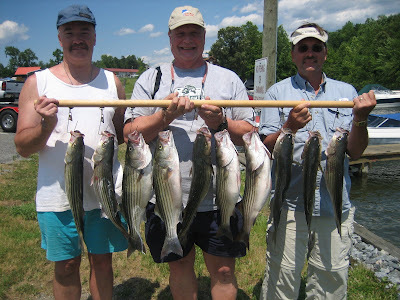 The guys took home enough for diner and released all the other Stripers to fight again.